In a Mexican-American family, which side of the border you were born on determines a lot, but not everything. The challenges faced by undocumented immigrants in the United States are well known. But what about children who were born here to undocumented parents? They are full U.S. citizens, but they often face their own legal and emotional burdens. 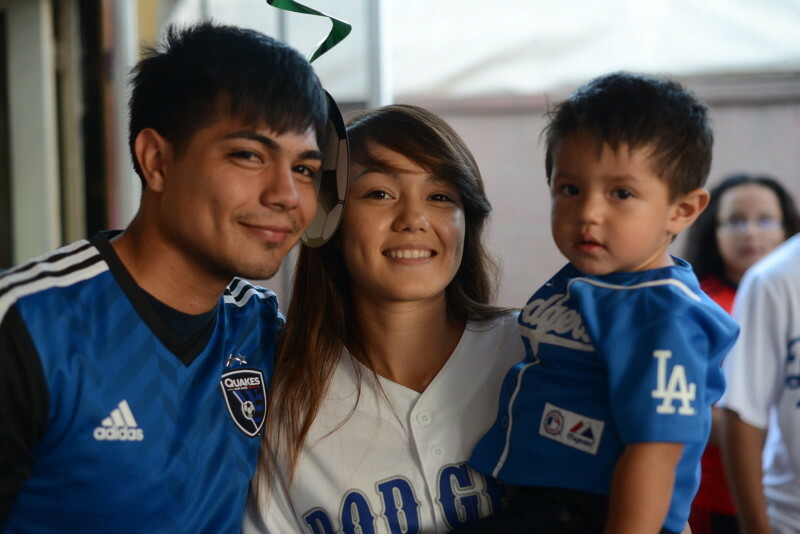 There is no mistaking it: Jorge and Lupe Herrera are family. As they gather in the living room after dinner with the rest of the family, the siblings' similarities stand out — from their coffee-colored eyes and animated smiles to their shared passion for music, travel and learning. "I'd love to go to Mexico, Europe," said Lupe, 18. "And Latin America," added Jorge, 22. There is one thing, however, that these siblings don't share: legal immigration status in the United States. Jorge was 4 years old when his parents arranged for family members to secretly bring him north from Mexico. Meanwhile, his parents made the treacherous journey through the desert and across the border into the United States. Lupe and her younger sister were born in Los Angeles. Jorge and his mom and dad remain undocumented. Lupe and her sister are natural-born U.S. citizens. But as they sit on living room sofas, laughing and teasing each other, a visitor would not guess that this is a family divided. The legal divide between Jorge and Lupe is a growing trend. A 2009 Pew Hispanic Center report shows that three out of four children of unauthorized immigrants are U.S. citizens by birth. The number of U.S.-born children who live in "mixed-status" families expanded rapidly, to 4 million in 2008 from 2.7 million just five years earlier. Lupe is a 21st century American teen. Walking through the Del Amo mall in Torrance, she's clad in fashionably ripped jeans, cellphone planted in hand. Her eyes sparkle when she sees the new spring styles the shops are displaying. "This is lace, I'd wear this … and the new jeans, boyfriend jeans, they're new!" she announced before she rushed off to check out a rack of flower-print miniskirts. But tears well up when she's asked about the divide in her close and devoted family. "I don't think it's fair for me to just have the advantages of what the U.S. gives," she said through sobs. "Because to me, basically, they are American." Legally, though, they are not. Lupe has all the protections of U.S. law, and she will never be deported. None of that is guaranteed to her brother and parents. Then there are the simple activities that most Americans never think twice about. Like piling in the car for a family road trip. In the family's living room, Lupe and Jorge's father, a quiet patriarch, becomes emotional when he talks about a dream he has -- to take his wife and children to San Diego to visit Sea World. It's less than 100 miles from the family’s home. But it's impossibly out of reach. "You have to have identification to travel there," Jorge said. Sea World, he explained, is too close to the Mexican border and "everyone knows about the immigration checkpoint in San Clemente." But Jorge and Lupe's parents, who took that perilous journey across the desert to keep their children from lives of certain poverty, have reason to be hopeful. Their first-born son, Jorge, is now a junior at UCLA -- the first in his family to ever attend university. His mother and father went only as far as third grade. Jorge says he got to college because of the tenacity and work ethic he learned from his parents, as well as a California law that allows qualified undocumented students who were brought to the U.S. before age 16 to attend school at in-state tuition rates. 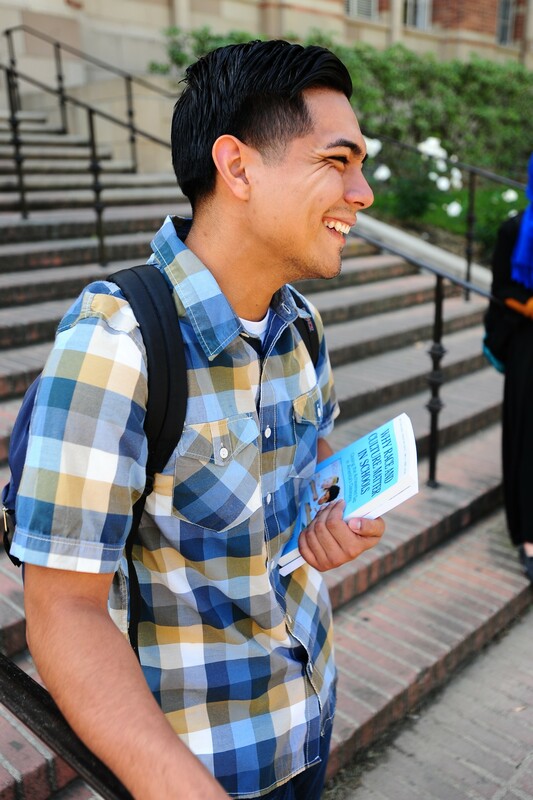 At college, Jorge became a community organizer, educating other students about their rights and helping them enroll when they otherwise would have given up on higher education. Ironically, it is now the undocumented Jorge who provides inspiration to his little sisters. "Being the first one in the family to go to school, it comes with a big responsibility, which is teaching my sisters the importance of education," he said, resting his backpack on a concrete bench near his classroom at UCLA. "More than a brother, I want to provide guidance. Someone there to say, 'It's OK, get back up, let's figure it out together – If we fail, we fail together. But as well, if we fail, we get back up together.' "
Now Lupe is following Jorge’s lead and applying to college. As an American citizen, she'll file the standard application and financial aid forms, rather than special forms the state designed for kids like Jorge. But not all of Lupe's paperwork was written with students of undocumented parents in mind. "It's like, if my parents are undocumented, then I'm undocumented," Lupe said of the federal financial aid process. "It doesn't matter if I am a U.S. citizen or if I'm not because, either way, my parents are not, so it doesn't change anything. When I tried to apply, they asked for my parents' social security and … we can't put what they don't have." Lupe tried repeatedly to submit her financial aid application as the instructions indicated. After many bounce-backs and error messages, Jorge's years of experience helping students through complicated college applications paid off. He was able to figure out how to file Lupe's application manually. So Lupe will be able to follow her big brother to college. "I don't know how he did it," Lupe said, smiling. "He just told me it was done." As her parents' first-born U.S. citizen child, Lupe hopes one day to make her family's biggest dreams come true. "When I reach that certain age -- 21 -- I will be able to give my parents papers for them to be in the process of becoming U.S. citizens," she said. The process is long and complex, with many risks of failure. Jorge's road is even more difficult than that of his parents. But he remains undaunted. After earning his degree, he hopes to work for nonprofit organizations that help people in his community, while he returns to school to earn a master's degree. "Fear is only as big as you make it," he said, as he sat together with his family. "It comes from inside you, so it can never be bigger than you. You either create fear, or you crush fear. So one way or another, we are going to manage. Sticking together and being united, that’s what evens out the playing field."